i bought this book after reading and hearing countless number of recommendations, and i'm so glad i did. it's an intelligent book, with a specific focus; to get the reader to eat green smoothies. the green smoothie craze is pretty big in the health food industry at the moment, and the raw food community. she mentions in the book why you ought to opt for a smoothie rather than a juice - i totally agree with her on this one -, she also mentions why you should choose organic rather than conventionally grown produce for your smoothies - another compelling argument, with some amazing facts and figures in it showing the nutrient properties of different veg. it details all the reasons why you ought to drink green smoothies, and although sometimes the science behind what she says is a little bit relaxed, and not quite as well researched as it could be, there is always logic behind what she says. there are loads of testimonials in the back of the book, which are really interesting to read. i dare say though that quite a few of the participants were already on the path to a healthier life. and 30 people isn't exactly a wide test range. BUT, once i finished reading the book, i did feel encouraged to eat more greens and to try green smoothies. making a smoothie isn't always that practical, but she does suggest making a large batch for a couple of days, which you can then store in your refrigerator: i have yet to do this, as we never have that much storage space in our fridge! so, if you want to know the reasons why you should eat more green smoothies, then i would highly recommend this book. it's very motivational and easy to read, and it's also a great start to a healthier lifestyle! 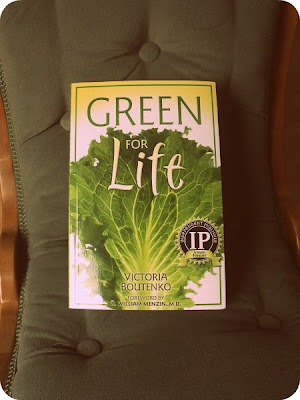 I bought this book from Sergei Boutenko himself (Victoria's son) along with Fresh:The Ultimate Live Food Cookbook at a wild edible talk and walk here in Melbourne a few months ago. Really interesting!